Tynemouth Longsands, which is featuring in the new Metro advert. Local attractions are to feature in a new advert promoting places to go via the Metro. A new campaign has been launched to inspire days out travelling by the Tyne and Wear Metro, aiming to build on latest figures which show the fastest passenger growth outside of London. 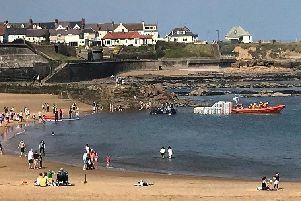 ‘Good to Know’ is Metro’s first television advertising in more than ten years, and features a variety of destinations around the network, including King Edward’s Bay in Tynemouth. Emma Brough, customer service director at DB Regio Tyne and Wear, which operates the Metro on behalf of Nexus, said: “We’re encouraging our customers to make a day of it this summer by exploring as many of the fantastic places to go and visit located next to a Metro station. Metro will be teaming-up with a host of popular attractions to provide an exclusive range of special offers and discounts for its passengers this summer. Metro’s friendly character will be meeting families and handing out free activity packs and spot prizes at Tynemouth Blue Reef Aquarium from July 24 to July 26, between 11am and 3pm.